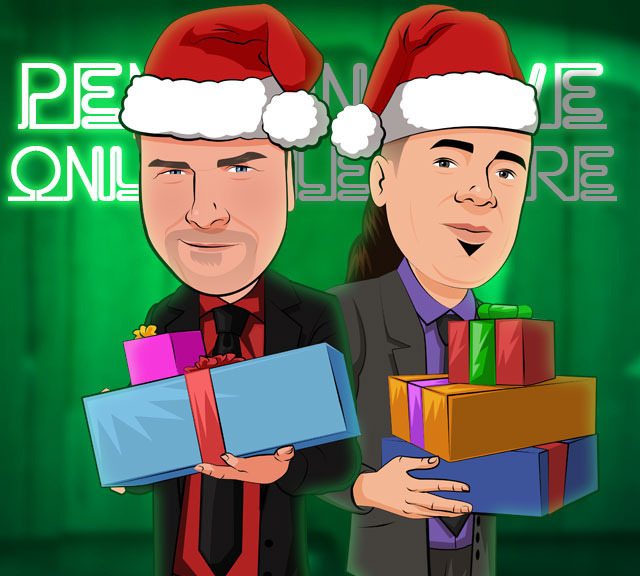 Today, when you order "Scott Alexander and Dan Harlan Holiday Special 4 LIVE", you'll instantly be emailed a Penguin Magic gift certificate. You can spend it on anything you like at Penguin, just like cash. Just complete your order as normal, and within seconds you'll get an email with your gift certificate. 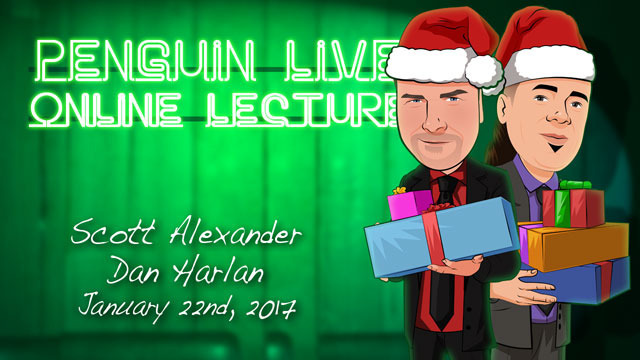 Scott Alexander and Dan Harlan Holiday Special 4 LIVE (Penguin LIVE) SUPPORT LIVE MAGIC. DOWNLOAD THE FULL LECTURE TODAY. This lecture contains language and themes that some may find offensive. Intended for a mature audience only. Safety Pin Swallow Scott’s take on a version of the timeless Razor Blades or Needles from the mouth. This one is not only extremely deceptive, but also super easy to make at home with stuff you probably have lying around. Apple Jacked Scott shows you an alternative routine with his version of Gene Elmo’s "Silk in Apple," and goes over some of the fine points of the routine. This is great for all audiences, from kids to the most skeptical adults. Its a real fooler! Mexican Paper Tear Scott tips the work on his diabolical version of the Leipzig Cigarette Paper Tear. This is a funny routine packed with jokes and one-liners but is really a powerhouse, pack small, play big effect. Musicallity Scott discusses ideas for effectively choosing and using music in your act. He talks about how music can really inform your magic and stage presence. Demonstrating a simple Linking Ring routine to three different pieces of music, Scott illustrates and comments on how each one is becomes different, just by the song choices. He follows this up with a performance of his CARD TUNES routine, which uses several different songs, and allows you to see how music can instantly spark memories, emotions and feelings. Crack Date This is Scott’s irreverent and funny fusion of Al Koran’s "Gold Medallion" and TA Waters "Back Date.” With a prediction that ends up in the most unlikely of places. Imagine if Derek Zoolander was a mentalist! Cake in Hat Scott’s out of the box twist on the classic Al Baker “Baking a Cake in a Hat" is one that you will use for your kid shows or birthday party gigs. It takes the magician in trouble syndrome to a new level and makes the kid the hero. It has a huge, surprise production at the end as the cake vanishes, which leaves the kids screaming and laughing out loud! White Russian Roulette Famous for his Russian Roulette routines, “Shattered" and "Nailed It," Scott once again dips in to that well and comes up with a bucketful of fun. This is a non-lethal, but heavily consequence filled routine that pits your cel phone against a spectators, all to win a “fabulous prize.” The ending is one they do not see coming, and revives a long dead classic effect of magic that is electric! If you've never been to a magic lecture, there's never been a better time. Sunday, December 25th, at 7:00pm, we're streaming Scott Alexander and Dan Harlan Holiday Special LIVE in a spectacular 2-hour online lecture. Watch and learn things you won't find in any book or DVD. 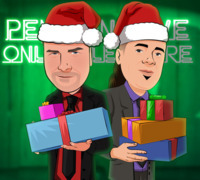 Purchase the Scott Alexander and Dan Harlan Holiday Special LIVE product. This is your ticket. On Sunday, December 25th, anytime before 7:00pm Eastern, click the MyPenguinMagic area at the top of the Penguin site. You'll see the stream appear 1 hour before showtime. At 7pm sharp, Scott and Dan will hit the stage and begin his JAM-PACKED professional lecture. Wow!!! Both of these guys make me love magic again. Two stand out from Scott: Cigarette paper and the Safety Pin effect. Loved them! He also gave me a memory: My first store bought magic effect, when I was about 6, was the EZ Hat Loader. It was great to see it used in his routine. Two stand outs from Dan: The Poker routine & the Bent Nail. Just some great stuff there. But there's so much more... Get it now! 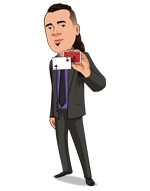 Don't miss Scott's take on BackDate... with an easy to build gimmick. Amazing! Or Dan's take on Think a Drink. Fantastic thinking!!! C'mon, guys, you're getting some great tips and tricks and techniques and much more. I really enjoyed this! Dan and Scott did an excellent job keeping the pace just right. A great blend of magic, song, and humor. I found the effects to be quite strong, and I would suspect everyone could find something of use as there was a variety of magic(parlour, mentalism, close-up). I should mention that there is a fair amount of "adult" humor so it may not be appropriate for younger viewers or those easily offended. I thought it was great and laughed out loud many times, I loved the silly jokes. Thank you Penguin and Co. for a great Holiday tradition! Thank you also to Scott and Dan for all your hard work...it showed and was really appreciated. Hi everybody, Merry Christmas to all. Every time I have the chance to watch Scott and Dan performing and teaching, it's just a great oportunity to me for learning new things about magic and beyond. Thanks again for taking the time of doing this, I really think the success they have, it's because of the quality of their ideas and performances. I'am looking forward to see a new lecture on 2017. Rock on!! and the best for all of you. I'm a huge fan of Bananachek, I can't believe they got him to perform! Best lecture ever! Lets not only support live magic but also live crazyness with these 2 loose cannons bringing us a professional ( seriously????) x-mass show with some x-rating. A show that fits like a square peg in a whatever magical hole. I just love it and them for that. Can 't wait till next x-mass, thnx so much guys for some fun tricks in a crazy wrapper. Cheers for "Harlander"! This is always a highlight of the Penguin season. The only problem was that it was on Christmas night. I don't think anyone would have minded having the lecture on Friday or even Thursday so that it could be before Christmas. A second small problem is that it wasn't live. Having it live was so great because of the contests, the tweets, and all of the fun that a live show brings. Please, bring it back live (no matter what night it is on). Still a great time and a great gift from Penguin to all of the customers. Great magic, some good gags, and some that fell flat but were funny anyway. Dan and Scott are incredibly creative. You can learn just from the way that they take some simple props and make a great routine out of it. If it were live before Christmas, I would have loved it even more but I can complain about a gift. not for the squeamish, faint of heart, or those sensitive to mind warping themes or colorful language. Once again, Scott Alexnder brings classic magic back to life and breathes new life into some old props that are collecting dust in your collection. This time, Dan is not just the host--he's the co-star. For any Dickens fans ("fans" - not purists), you'll love the Christmas Carol bit. On a general theme, I didn't learn very many new tricks to put in my show, but what I did learn was far more valuable--getting into the old books, telling a story your audience will be interested in and having a blast doing it! I'm looking forward to Christmas 2017 to see what Scott and Dan will do then, and you can bet I'll be in the audience for that one too! I am a born again Christian! I loved this lecture! This lecture has an amazng amount of awesome material. Don't be such a prude. Yes,the language and sexual references are plenty. (and hilarious!). Please, embrace this creativity as the work of two of the greatest artists of this generation. Yes, Pray for them. Get this lecture and learn, learn, learn! Please, Dan and Scott, please release more of this great creativity! There is a lot of magic packed into this special. Dan and Scott are always great to watch. Worth the investment just for the inspiration of creativity. These are always a lot of fun, each year I look forward to watching and discovering some new and different effects.